The Czech business services sector grew by 12% in 2018, it currently employs 100,000 people and has a 6% share in the Czech GDP. This means that the sector has become one of the most important branches of the Czech economy. Services in the field of information technologies are growing the fastest. Employees in IT outsourcing now make up 40% of all employees in the business services sector. 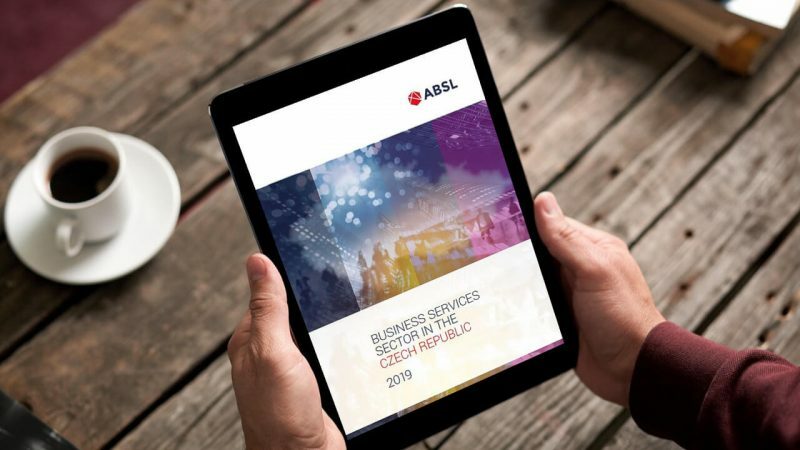 This data is the result of a survey by the ABSL Association, which associates providers of business services on the Czech market. The number of centres active on the Czech market has increased year-on-year by over a fifth and there are now 290 centres functioning in this country. Because they provide services to customers worldwide, a total of 32 languages are spoken at these centres and 35% of all employees in this sector are foreigners. Each centre employs an average of 391 people, however, 57 centres have over 500 employees. Companies in the business services segment are not just expanding from the aspect of the number of employees but also from the aspect of the supported processes and customers. Growth of this segment is closely related to digital transformation of companies, an integral element of which is also centralisation of processes and their assignment to specialised business services centres. Companies are focusing on the core of their business activities and are transferring effective performance of specific activities to specialised divisions or to outsourcing partners. The main driving force behind the growth of this sector is the massive adoption of modern technologies, particularly robotic automation, machine learning technologies and artificial intelligence. “In its Vision 2025, the ABSL predicted that technologies in the business services sector would essentially cause a revolution by 2025. They will change provision of services, contribute to elimination of a number of former professions and to establishment of new professions, which require different training and abilities. Current results show that this prognosis is already starting to come true,” says Jonathan Appleton. Software robots are already doing the full-time jobs of 4,000 employees in the business services segment, which corresponds to 4% of the total labour force of Czech centres and is practically twice the number compared to last year. A twofold increase can also be expected next year. On average each centre has 14 working “robots”, whereas an average of 29% of the processes executed at business services centres are automated. 1,200 experts devote their activities to programming and implementing robotic automation in this sector. As well as robotic automation of processes (72% of centres), organisations are also implementing tools falling within the category of artificial intelligence. 12% of centres now use artificial intelligence in 18% of their processes and another 14% are in the process of testing this method. However, centres plan even more massive adoption of these technologies during the oncoming period (see graph below). Only 19% of centres do not plan on using any of these technologies for the time being. Automation is progressing most quickly in the field of financial operations, followed by human resources, customer services and IT services. And the primary jobs of employees are also changing as a result of these innovations. For the first time the most frequent positions are not being used to realise classic services (SSC, Shared Service Centre), instead the numbers of IT and research and development positions are growing. At this time 40% of employees in this segment work in IT outsourcing, 37% in SSC, 14% in research and development and 9% in BPO (Business Process Outsourcing). The success of the business services sector is also based on the fact that the Czech Republic has a generally good reputation in the eyes of investors who are opening new or expanding existing business services centres in the Czech Republic and also in the eyes of potential employees from abroad, whose importance is growing in connection with the very low unemployment rate in the Czech Republic. Over 35,000 foreign experts are employed by Czech business services centre today (i.e. over 35% of all employees) and 81% of them came to the Czech Republic from EU member countries. A quarter of business services centres actually employ more foreigners than Czech citizens. “Recruitment of talents in our sector is complicated not only by the difficult situation on the Czech labour market, but also by rising demand for employees. As well as having the proper expertise, employees in our segment must also speak foreign languages, which are often also very unusual. This is also one reason why the time needed to recruit an employee increased year-on-year by 1 week, to 8.1 weeks,“ Jonathan Appleton comments, with the understanding that the planned amendment of the Alien Residence Act could be a great advantage in this matter, because it would enable simpler recruitment of highly educated experts form countries outside the EU and thereby help Czech centres to remain competitive and continue expanding. During the next two years 72% of centres plan on expanding their offer of services and on endeavouring to acquire new clients, 82% of centres want to expand their services for existing clients. The segment’s increasing focus on IT, as well as automation projects across centres, has caused increased demand for IT specialists and new types of experts. This currently most often concerns specialists in RPA or AI, however, in the future the most sought-after positions will be data scientists and analysts, experts in digital transformation, social media and digital content administrators and specialists in customer experience (designers, testers, managers….). According to last year’s Future of Jobs survey, which was published by the World Economic Forum, 54% of employees of business services centres will need to acquire new knowledge and skills by 2022. This is why companies will have to focus on developing the knowledge and skills of their employees even more. Czech business services centres realise the need for investing into education, 60% of them are already aware that their employees lack skills in the field of technologies related to automation. “As a result companies in the business services segment collaborate intensively with universities and also invest into corporate education. The provide their people with an average of 43 hours of training a year, which is nearly four times the national average according to the most recent data by the Czech Statistical Institute,“ Jonathan Appleton explains. Within the terms of corporate education companies are also focusing on the segment in which the employees are active (e.g. ACCA, CIMA or CFA training for the financial sector, CISA and ITIL training for the IT sector) and also on language courses, analytical thinking, communication skills, time management, project management and leadership. The newly implemented ABSL Fusion training programme, which focuses on development of top managers of business services centres, is also devoted to these activities.